A very long trip for a game which MAY go ahead. Let’s assume it will. The problems in Ukraine have resulted in AFC not needing to take a 400 mile round trip to somewhere out in the frozen wastes, this has to be a positive. Also, it means that it will be an away fixture for FC Vorskla. Ahead of Sunday’s game against the chaps from Harrow, Emery will be selecting a team filled with B players and youth, though to consider Ramsey a B player could be construed as an insult (same could be said of Holding, Mhiki etc). Strange that we are taking only one CB with any first team experience, I wonder why Pleguezuelo is not in the squad as he did well against B’pool in the Carabao. Instead we have Medley who is just 18. Could Elneny play at CB or Licht? Perhaps this team is a bit attack orientated and Willock may get a start or M-N (Cons) will operate in the same manner as Wardrobe last Sunday. Given Mhiki’s dreadful performance at B’mouth he needs to find form and playing time is the only solution. Playing Henrik €250k p.w. is excessive given his AFC performances and it is easy to understand why Ramsey, who has consistently done well for us, considers he should earn commensurately. There is an interesting article on Arseblog (written by Tim Stillman) on the need for Arsenal’s youth academy to deliver first team players. We have seen Bellerin and Iwobi come through, bought some fine kids (Curly and Terrier), now we need to see if Eddie, M-N and Smith Rowe can make that huge step up from being excellent in the Academy to being reliable first team squad members. I expect many player sales in summer which will give opportunities to those with the talent and tenacity to take them. We saw that Vorskla are a limited team who gave us few problems at THOF but tonight they will be playing a weaker AFC team and we can expect a tough fixture. A draw would be good, a win better. This entry was posted on Thursday, November 29th, 2018 at 9:39 am and is filed under Uncategorized. You can follow any responses to this entry through the RSS 2.0 feed. You can leave a response, or trackback from your own site. Great post and interesting views about the academy. My line up for tonight (if the game goes ahead): 5-3-2 in defensive phase that turns into a 3-5-2 in attacking phase. Flash info: Rabiot may leave PSG. I suggest a direct swap between Ramsey and Rabiot. You will like Rabiot and you will also hate him but Emery rates him and I think he would bring a technical touch to our midfield with his dribbling ability so what do you say? That’s a fine assessment of our options. Some of the players you mention didn’t travel. Thanks for the read BR, I am in Spanish cafe in the middle of nowhere, weather great, cycling fantastic. Costa Blanca Arsenal supporters club for me this evening. A stimulating article BR and especially with the Independent article. For me the days of Tony Adams coming in to the Arsenal first team at 17, cocking up, but being given the opportunity to learn through mistakes with the conclusion that we know took place. “Opportunity” is the word Akpom stresses and I believe we need to provide more opportunity for talented young players to learn from their own mistakes at First team level. Bring on some of these boys with 25 mins to go and tell them “influence” the game. Sometimes it will work, sometimes they will have no influence, sometimes it will be a disaster potentially for both the Team and the future of the young player. No one knows who will make it in the current world of English footie. Eddie scored two and we love him. Has he had a fair chance since? Coaches, believe in your judgement, give the talent you judge to be talent, a go. We the supporters must make allowances for the end result. What if we find another Rocky, another Liam, another Tony Adams? LBG. The pressure for Emery to deliver an improvement (probably Top 4) is immense, as such he will not gamble with young players in the PL and who can blame him? Playing kids in meaningless games in the Europa or the Carabao just gives them a glimpse, making them more likely to sign a long term contract. Good for the club but perhaps not so great for the youth player. There is a post in this …. Sometimes pressure has to be foresaken for the potential greater good. After all it is only sport! 10/11. My best of the season! Very nice goal. Fine pass from Ramsey who is already bossing the game. Go on you youngsters, ” influence” the game. The Corporal is top quality. He’s now found his position. Watch out Mustafi, your place is in doubt. A Medley of talented youngsters. Commentary team most impressed with Willock, Smith-Rowe and Jenkinson. It looked like kids stuff to me. Minus 12 !! And I thought I lived in a cold land. Boys did very well toninght with the result never in doubt. My MotM was Ramsey who was always in position to receive a pass, was accurate and penetrative in his passing and won/scored a penalty. A proper Captain’s performance. Anyone fancy writing some player ratings? I haven’t got time and LB is getting pissed with some gangster wide boys in Costa Blanca. 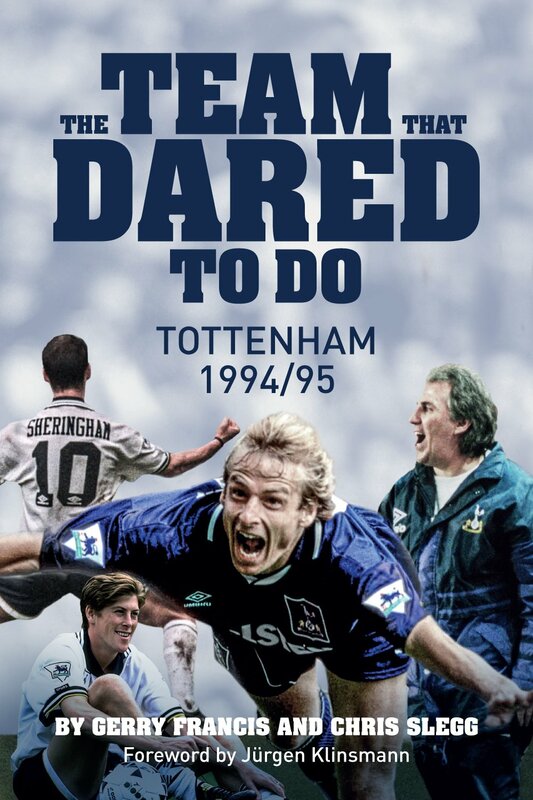 The book about Tottenham’s quest to finish 7th. The team that dares to be Spursey. Roll on Sunday. 17th December for Rd 32 draw. Much to be finalised before then, but Arse can’t face best four teams in Champions League groups who finish third. Best fact is second leg at home. Thanks a lot, Raddy. 🙂 Nice curtain raiser. Sorry, bad times. Knot ear.